In 2006, Prince George Airport Authority received a $11,000,000 loan from Northern Development through the Economic Diversification Infrastructure program towards this $93,000,000 project. 2012- Prince George Airport's goal is to be a North American cargo gateway and distribution centre to and from Asia with up to 15,000 fuel stop landings per year and to be a passenger hub to North America and the world by 2020. 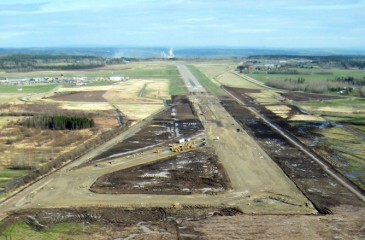 In 2007 with a $11,000,000 loan from Northern Development and funding from both the Government of Canada and the Province of British Columbia, Prince George Airport's runway was expanded from 7,400 feet to 11,500 feet, making it the third longest commercial runway in Canada after airports in Vancouver and Calgary. The airport is now capable of landing, refueling, and loading/unloading the wide bodied Boeing 767 and 747 aircraft that trans-Pacific cargo and logistics carriers operate. The expansion of the runway at the Prince George Airport increases its marketability as a gateway to Asia, and strengthens northern British Columbia's overall competitive advantages within the transportation and logistics sectors. With Prince George strategically located on the great circle route, as well as situated close to Canadian Railway Company's Prince George Intermodal facility, at the crossroads of two major Trans-Canada highways, and having the container ports of Metro Vancouver and Prince Rupert both within 800 km of Prince George, this airport expansion is a major incentive for airlines, cargo operators, and logistics companies to steer trade routes through northern British Columbia. "It would have been impossible for an airport of our size to undertake such a major project without the generous assistance of the Federal and Provincial governments, and Northern Development Initiative Trust. The development of the Northern Gateway will provide many of our trading partners with reduced costs in getting their products to market." "We appreciate the continued support of Northern Development Initiative Trust on the financing arrangements with regards to the runway project as it has allowed us to adapt to the ever changing economic and competitive climate." The Prince George Airport is positioned to become an important link in the emerging Northwest Logistics Corridor. North America's newest container port at Prince Rupert, British Columbia is the westernmost end of a 1,000 kilometre corridor dedicated to logistics connecting to Prince George's CN Rail intermodal facility and points beyond in eastern Canada and mid-west United States. On November 17, 2009, the first Boeing 747 cargo aircraft touched down at the Prince George Airport, to refuel on a trip between Asia and Venezuela. In 2009, the Boundary Road Connector was announced, establishing a direct route between Highway 16 East and Highway 97 South. This connector road is a key transportation link for the future development of the Prince George Airport Logistics Park. Once completed in 2012, Boundary Road will be a Dangerous Goods Route, provide Intermodal connectivity to both rail yards, decrease network travel time, reducing congestion and air pollution and improve traffic safety on the City’s existing urban highways. In 2010, Western Star Ventures Ltd. completed the final design stages of developing a multi-tenant cargo cross-dock facility adjacent to the north-end fueling apron and the recently announced fuel farm at the Prince George Airport. This new facility will be designed for cargo storage, inspection and transshipment as well as equipment staging for north end operations. The 25,000 sq ft facility will also offer inspection and administration space for the Canada Border Services Agency and other on airport service providers. Strategically located on the North Pacific Corridor and on Great Circle air routing - the Prince George Airport Authority is an integral part of the Asia Pacific Gateway linking the economies of Asia and North America. The airport with Canada's third longest commercial runway offers carriers flying trans-pacific routings a Canadian alternative to traditional airport gateways.